Unter Power-to-Gas (PtG) is usually understood as the conversion of electrical energy, preferably from fluctuating renewable sources, into an energy-rich fuel gas, which is intended to be fed into the natural gas network for storage and subsequent use. H2O (liquid) = H2 (g) + 0,5O2 (g) + 286 kJ/mol. CO2 (g) + 4H2 (g) = CH4 (g) + 2H2O (g) -165,0 kJ/mol. Published catalytic process conditions from previous test facilities are relatively high temperatures in the range 230 – 780°C (focus 300 – 400°C) and relatively low pressures in the range 1 – 86 bar (focus around 30 bar). Remarkable here is the relatively high reaction heat that has to be dissipated, which is an energy loss. Accordingly, there are published energy efficiencies of the conversion of hydrogen to methane only at 40 – 50%. Up to now, the Sabatier process was not realised industrially because it was not required. Global hydrogen production of approx. 50m t/a is based essentially on natural gas (methane); up to now, methane has never been produced from hydrogen anywhere. In the last few years, some smaller Sabatier installations have been realised as a result of the new objective of energy storage. CO2 (g) + 3H2 (g) = CH3OH (g) + H2O (g) – 49,6 kJ/mol (Silicon Fire-reaction). The reaction conditions for the Silicon Fire reaction are approx. 270°C and 80 bar. The higher pressure leads to small reactor dimensions, the relatively low reaction heat enables energy efficiency of up to 80%. Fossil methanol is used above all as a chemical raw materials, but also as a solvent and fuel additive. 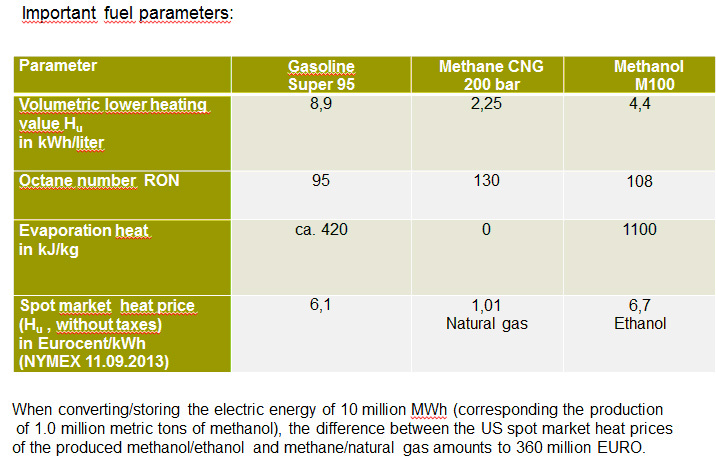 Methanol (chemically very similar to ethanol) is an excellent fuel for combustion engines, superior to petrol in all parameters with the exception of only half the volumetric calorific value (see Table). This is why all highly loaded model engines use methanol fuel, in future probably the range extenders of electric vehicles will as well. Methanol can be used as a pure fuel or as a petrol additive; according to current European fuel standards, 3.0% methanol by volume are permitted in petrol. 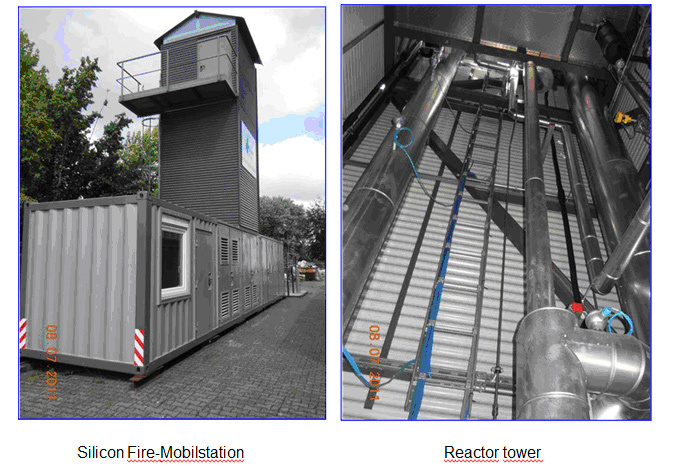 Silicon Fire AG, Meggen, Switzerland, developed the PtL technology, applied for various patents and realised it in an industrial pilot plant (see photo). Particularly advantageous is the Silicon Fire process “direct oxidation”, in which electrolytic hydrogen and carbon dioxide combined with synthesis gas from natural gas are used for the methanol synthesis and for the synthesis gas production of electrolytic oxygen. The EU demand for renewable fuels of a potential reduction of 35% greenhouse gas is complied with in this process. The fundamental advantage of PtL in comparison with PtG is the considerable higher value added of PtL. With PtG, the high-value and expensive energy of the hydrogen is downgraded to the level of natural gas, the second cheapest primary energy carrier after coal, which on a large scale would require new multibillion subsidies, analogous to Germany’s Renewable Energy Act. In contrast, PtL produces a high-value renewable liquid fuel that, like bio-ethanol, can substitute mineral oil fuels, but without the restrictions of biofuels, and whose specific heat/energy price is four to six times higher than methane (= natural gas)!